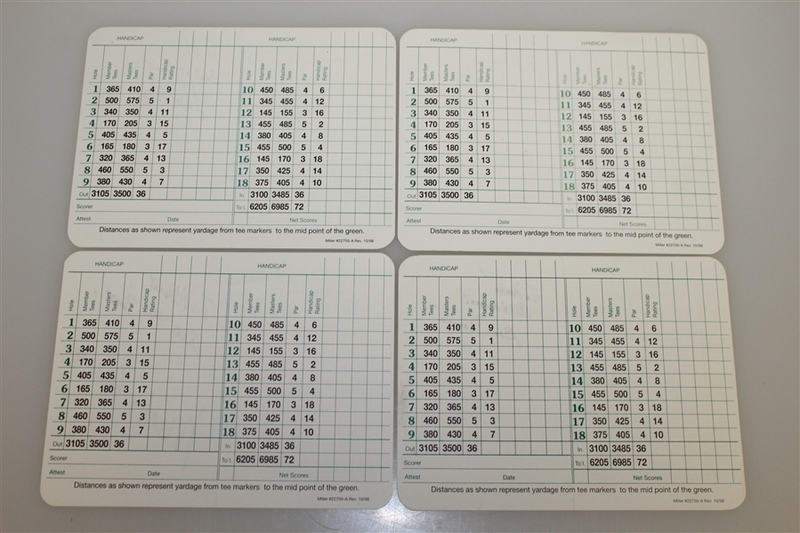 This lot contains four Augusta National Golf Club signed scorecards. 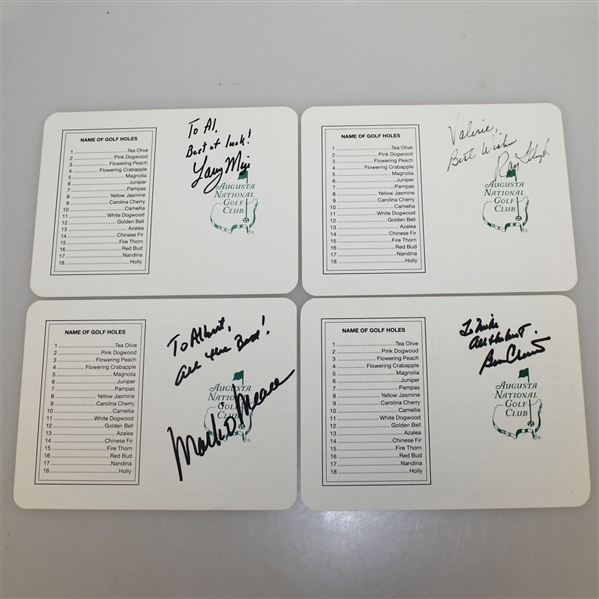 Each is signed by a well known figure in professional golf. Larry Mize (top left) is known for his career defining chip shot on the 11th hole of the August National Golf Club. This shot won him the 1987 Masters Tournament in a playoff over Seve Ballesteros and Greg Norman. Mize is also the only Augusta native to win the tournament. Mark O'Meara (bottom left) holds 16 PGA Tour wins including an Augusta National Masters tournament victory in 1998. O'Meara shot 279 in the tournament. Ray Floyd (top right) is a decorated golfer, having 65 professional wins. 22 of those were PGA Tour wins and four masters wins. In his Augusta National victory in 1976, Floyd shot a 270 and won wire-to-wire. Floyd's score was the lowest score in tournament history for 21 years until it was beaten by one stroke in 1997 by Tiger Woods. 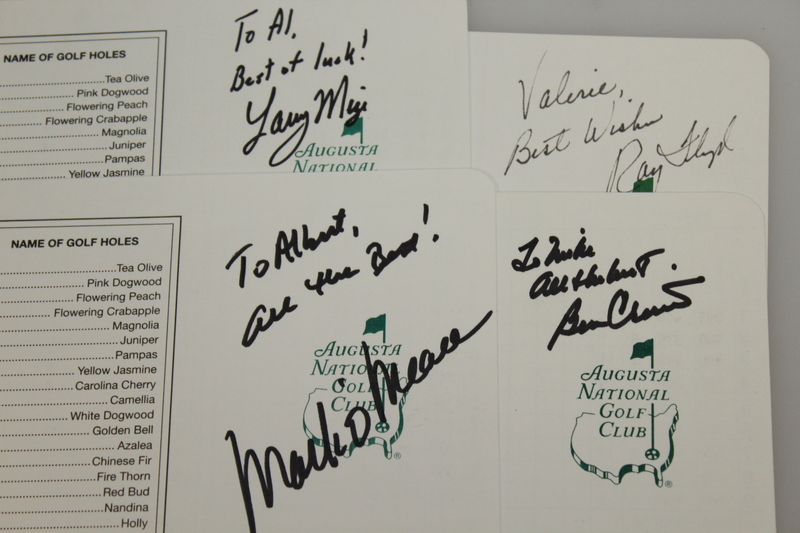 Ben Crenshaw (bottom right) had a number of appearances at Augusta National. Two of these appearances resulted in victories. His first victory in 1984 was narrowly captured with a score of 277, beating Tom Watson by 2 strokes. In his second Augusta National victory in 1995, Crenshaw shot a 274 and was able to best Davis Love III by a stroke. James Spence Authentication (JSA) has reviewed these signatures and their auction letter of authenticity will come with this lot.